Dawkins speaks in very well-turned phrases: complete, spare, witty -- pretty much the way he writes. He speaks that way even when he extemporizes, for example when answering questions. No meaningless interjections such as uh's, um's or like's, no trailing thoughts. But, while this may make him seem old-fashioned, his prowess with technology overturns that impression. At the Center Of Inquiry reception he seamlessly combined socializing with working his iPhone and MacBook; for a moment that made me feel validated, as I too like to tap on a keyboard while socializing (but perhaps a VIP is exempt from the gander/goose comparison :-)); later I realized he wasn't idly surfing; he was looking up the Texas Bill of Rights for a quote to include in his speech. How did he quote it in his presentation? You can read about it in this Susan Brown's blog post. 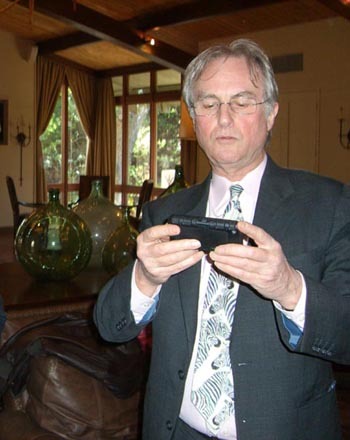 Richard Dawkins with his iPhone. More pictures from the reception and the lecture can be found in my photo gallery. Later a UT student asked him a question: why hasn't the freethought community organized to create a response to the creationist movie "Expelled" -- for example, by raising money and making a movie debunking "Expelled"? Dawkins responded that making an "official" movie and trying to get it into theaters might not be the most effective way. These days, with everyone having a video camera, any one person can make such a movie, and the best way to distribute it might be simply by posting it on YouTube. There it may get more views than it would in movie theaters. Yay for the older generation scientists who know how to leverage internet for political change! 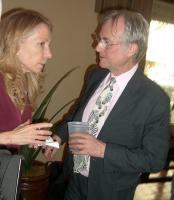 Robin Elizabeth "Liz" Cornwell, a psychology professor at Colorado University Colorado Springs, and Richard Dawkins working on his presentation. More pictures from the reception and the lecture can be found in my photo gallery. It is interesting, the range of questions you get at an event of this kind. Some of us expected there would be religionist hecklers, but there weren't any. That's not to say some of the questions didn't come out of the left field. More about them below. But most questions revolved around whether an in-your-face atheism was a good strategy, or if a more conciliatory one would be more productive. Question. College students have a lot of causes to fight for, and I know a lot of students who think that the cause of atheism doesn't need to be actively pursued. Their causes against the war in Iraq, or to fight AIDS. Why do you think proselytising atheism is important? We are living in the 21st century, and therefore we have an opportunity to form a proper, straight-eyed vision of the universe in where we live. We are product of evolution that somehow managed to produce objects of prodigious complexity, like our eyes, or brains. It's all but a miracle that it managed to produce us. It's a supreme position to be in. My reason in promoting this worldview is not a negative one; I don't want to come across not so much as a enemy of religion, but a friend of truth. Let's make use of our position of being able to learn the truth by scientific advancement, he urges. As an atheist I sometimes worry that we will become a monster that we battle with. How can we proceed from today and [to cure the illness] without becoming the monster that we fight? Richard Dawkins said an atheist might take a conciliatory stance, for example, by saying it's all right to believe in God, and at the same time to believe in evolution, and Dawkins is glad some people are doing that. "But my way is a little more monstrous," he said. Some people are nominally religious, but have some skepticism towards religion. It could be that they would resonate with a more satirical approach, a ridicule approach, rather than a conciliatory one. 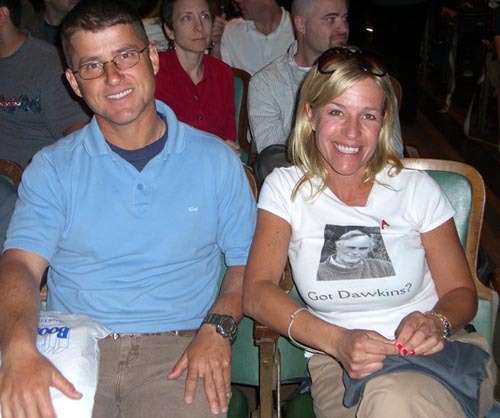 Mary in the audience in a "Got Dawkins?" T-shirt. This may be the best filled-out atheist T-shirt I've ever seen! :-) More pictures from the reception and the lecture can be found in my photo gallery. Some questions showed a bit of a naive grasp of science. Question. I've heard about physiological differences between atheist brains and believer brains [which makes it futile to debate with them]. Do you believe that? Any two brains have got to have physiological differences, Dawkins replies. Somebody likes Beethoven, and somebody likes rap -- there's gotta be physiological difference. When you are arguing with somebody, the argument you're having is going to have a physiological impact on your brain. "It could be that there is a genetic difference between religious minds, and, shall we say, intelligent minds," he says (Audience laughs. ), that is unreachable by any kind of argument. But just because there are such differences doesn't mean that believers are futile to debate. And then you get even stranger questions that make you wonder why would anyone put such a question to a well-known skeptic. A young woman introduced herself as a fine arts student at UT and a lapsed Catholic of a year and half; her question was so meandering I didn't even understand what she was trying to say. Neither did Dawkins, apparently. Basically, she said that the current astrological age -- the Age of Pisces -- somehow proves that the Bible is incorrect, and she asked Dawkins if he ever thought of using this argument to debunk the Bible. Dawkins replied, I'm glad you are no longer a Catholic, and I wish you well on your journey to become a former astrologer as well. He added that astrology is baseless nonsense (even if not in those exact words). The woman said, she didn't believe astrology as well... but somehow in her mind the Age of Pisces somehow invalidated the Bible. She could not articulate how, though. Even as she spoke, and Dawkins asked her to clarify, she started retracting her question, and finished with "never mind, thank you". Dawkins then moved on to a next question. I guess I found this more unexpected than I would have found religionist hecklers, if there had been any. Some of the more interesting questions was what does Dawkins think of the vision of transhumanists such as Ray Kurzweil and Hans Moravec, who believe that humans will merge with machines (or, in less dramatic and more abstract terms, biology will merge with technology) in not-so-distant future. Dawkins says he finds such a vision at the first glance horrific, but probably only because he is the child of the 20th century, and he can't quite imaging such a future. If I understood correctly, he admits a possibility that if he was born at around the time this was happening, he would probably find it natural. He says he likes science fiction, and Moravec and Kurzweil might be right. But he doesn't have a view on transhumanism. 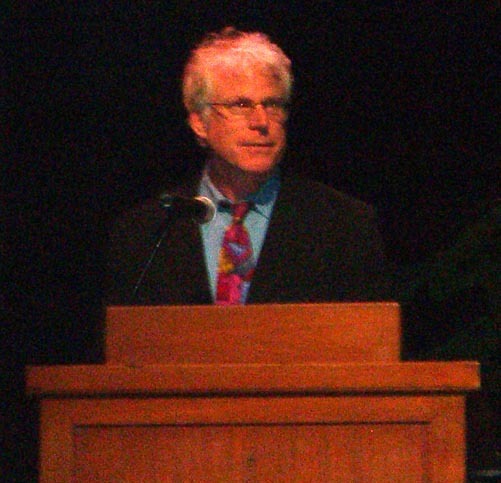 A UT professor David Buss introduces Richard Dawkins with these words: "when you have a leak in your pipes, you call a plumber; when you have a leak in your reasoning, you call Richard Dawkins." More pictures from the reception and the lecture can be found in my photo gallery. At the lecture I discovered, curiously, that most of the things Dawkins said I've already heard or seen attributed to him. That's funny, because the only Dawkins' book I've read is "The Selfish Gene", and most of the things he said were not in that book. For example. Most people's beliefs religious beliefs are determined by where they live. A map of the world's religions shows large patches of more or less uniform color. People in those areas have the same religion. It makes for a pretty strong evidence that most people don't choose their beliefs rationally, but acquire them as part of tradition, otherwise the distribution of religions around the world would be much more mixed. Children are born with no belief in god(s) and don't learn religious messages until later in life, so it is as ridiculous to say a Christian (Muslim, Sikh, etc.) child than it is to say "a socialist child" or "a Keynesian child". I guess I've absorbed Dawkins' philosophy by osmosis merely by seeing his quotes in the press. :-) I suppose this shows how far his ideas have penetrated into society. Dawkins said that if there is one thing we should take away from his lecture, it should be this. Creationists' basic objection to evolution is that random mutations can't produce organisms as sophisticated as we see in nature, or that it can't even produce organs of complex functionality, such as an eye. As the famous saying goes, can a tornado blowing though a junkyard produce a 747? If "random chance" meant putting a bunch of organic molecules in a shaker and shaking them until they come together in a shape of a human being, then of course one would have to wait much longer than the lifetime of the universe for that to happen. But therein lies the main misconception. Evolution does not work like a shaker that shakes the ingredients around, hoping that they'll stick together in a shape of a human. It works one beneficial random mutation at a time. Dawkins illustrates this by the analogy of a dribbling combination lock. Suppose you have a combination lock guarding a bank vault. You can't open a combination lock by chance, not unless you spent a million years trying different combinations. But consider a faulty (dribbling) combination lock. When you are getting closer to the correct number, the door opens just a chink, and a little money comes out. Then, knowing one correct digit, you try to guess the next digit, and again when you get to it, the door opens up a little bit. Then it wouldn't take you all that long to hit the jackpot. The problem with the creationist standard argument is they think evolution by natural selection is equivalent to a good combination lock, where you either get the jackpot or get nothing. The thing is that evolution is similar to a faulty combination lock, where occasionally you guess a correct digit; over millions of years it would be reasonable to guess all the correct digits.